“Will I ever need a blown product?” is not a question that readily springs to most minds, but “How can I get soil/pebbles/mulch/sand delivered to this hard-to-reach location?” is much a more common conundrum. 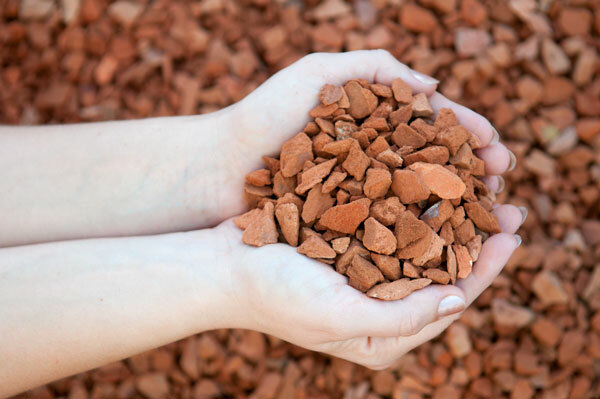 Here at BC Sands we can, and have delivered almost any landscaping material – from pebbles to soft organic soil – to almost any difficult to reach location you can imagine. We accurately blew potting mix exactly where it was wanted for a roof-top garden. The Cowra White we delivered to an inaccessible area of a small townhouse complex was a challenge with an excellent outcome. Our trucks have been kept very busy blowing wood chip mulch to newly renovated gardens on very steep slopes and waterfronts. A blower was the only way to get red wood chip to a long, narrow bed along the side of a sports centre. Before you order a blown product, you will need to work out how much you need. Here is a simple, 3 step formula to work this out with the most basic tools. Take a tape measure and determine the length and breadth of the area you want filled. Measure the depth you will need. Ensure that the depth is accurate – for example you would not want 50cm of wood chip mulch around your trees and bushes (100mm is usual), but you may want 50cm of crusher dust to compact an area that needs to hold heavy traffic. Finally, whip out your trusty pocket calculator and times the measurements together to get the dimensions in square metres and give us a call. Another consideration while doing your calculations is how far we will need to blow the material. We can guesstimate this for you, but if we need to go over an object (like a building) then you will need to tell us beforehand. There is a wide selection of materials that can be blown into hard-to-reach places. Everything from organic garden mixes to mulches to attractive pebbles and even plain basic sand. No more pushing wheelbarrows through narrow passageways or up steep inclines. No more passing buckets up hills or risking injury to your back carrying heavy materials to awkward places. Now you have wide range of choices as to what can be done with that dead area between the house and the side fence, or the space between the pool and the back fence. You simply order your chosen material and watch while it is blown into place – without all the hassle of you moving it around. Blown materials are an excellent way to fill those unsightly spaces, top-dress the back lawn or help stabilise a slope while the vegetation grows.